Violinist Tessa Lark, not yet 30, is soaring to stardom in multiple genres. 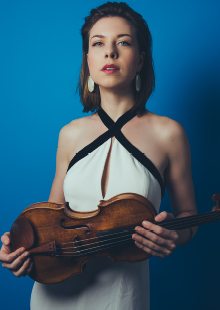 Recipient of a 2016 Avery Fisher Career Grant and winner of the Naumburg International Violin Competition and the Fischoff National Chamber Music Competition, Lark is a budding superstar in the classical realm and a highly acclaimed fiddler in the bluegrass tradition of her native Kentucky. Since her debut, Lark has collaborated with masters including Mitsuko Uchida, Itzhak Perlman, Mark O'Connor, and Ida Kavafian, and performed across multiple continents. Don't miss your chance to hear this rising star's “smoldering” (Washington Post), “high-energy” (The New York Times) playing in intimate recital at the St. Francis Auditorium!